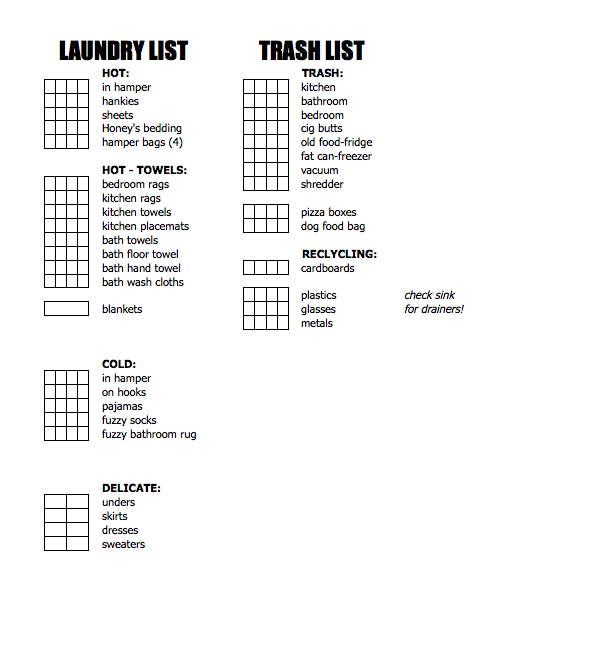 I have had many variations of this cleaning schedule since I began to make them. In fact, the newest variation, pictured below, was only made at the end of June. I use MS Excel to create a spreadsheet and as the weekends happen and I do my cleaning, I put X’s in the boxes. The categories on the left are the rooms in the house. I don’t necessarily start at the top and work down, but I do often clean a room at a time. In “WKD ALL” – All rooms, all must be on weekend (because I put the trash out on Sunday night) – I have more code. L B O M get individual x’s because I don’t always use the carpet rake/vacuum on every room at once. Living room, Bedroom, Office, Mancave. Those are our rooms with carpet. (The hall is small and I include with the living room.) For sweeping, I have Kitchen and Bathroom. The little asterisks (*) are to indicate that a rag would be necessary. I like to make sure I’ve done all the chores that result in a dirty rag BEFORE I launder the rags. Monthly chores are also shaded, based on when the task was last completed. For example: This month I was “supposed to” mop the floors the first week, but I will mop them this week (the third week). So in August, I will shade the third week, because by then, a month will have passed. Some things I do less frequently than once a month. (Notice I have blanks at the bottom if I think of other things.) In this newly-added section I list things I want to do, when I intend to do them, and when I last did. I try to clear the bathtub drain and clean the dish rack every two months. I attempt to disinfect, clean the vacuum filter, dust, replace my toothbrush, clean the class, change the Brita filter, and freshen the mattress every 3 months. I changed my toothbrush early because I was sick. I always change the Brita filter on time because that takes so little effort. Unfortunately, I haven’t been keeping up with all of those, and they are piling up as “need to be done”! I would LOVE to stagger these so they aren’t all needing to be done at the same time! My newest plan is to use that 5th week I’m planning on building in every month to catch up on these things. This is just so I don’t forget to wash, or throw away, anything. I used to have it under a sheet protector and dry-erase, but I like the weekly squares better. Thanks for reading – leave a comment and let me know what you think! This entry was posted in Cleaning, Organization and tagged clean, cleaning, Excel, free, organization, organize, spreadsheet. Bookmark the permalink.